Before introducing a most wonderful and simple Karttika vrata, we will highlight the ultimate vow of austerities to please Sri Sri Radha Govindadeva. Indeed, Srila Prabhupada prescribed the ultimate Karttika vrata for those rare, austere few who have acquired such a refined taste for Sri Harinama, which comes, according to the Puranas, after hundreds of births of chanting Hare Krishna! The majority of devotees, however, will opt for a more feasible vrata which suits their status. And since Karunamayi Srimati Radharani is in charge of dispensing the results and benefits of all Karttika vratas, one can certainly expect to receive lots of mercy and spiritual strength from any pure hearted simple vrata regularly performed to please our beloved Swamini Sri Radha during the most beautiful and auspicious month of Karttika. As the perfect transcendental exemplars of the topmost form of immaculately pure and self-less love, Sri Sri Radha-Govindaji derive the greatest happiness by praising, serving and satisfying each other. This truth is seen in all the writings of the Gaudiya Vaisnava rasika mahajanas i.e. 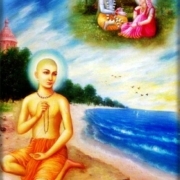 Sri Rupa Goswamipada, Sri Raghunatha Dasa Goswami, Sri Narottama Dasa Thakura and Sri Visvanatha Cakravarti. Our Gaudiya Vaisnava acaryas have written many amazing prayers in praise of Sri Krishna, Sri Radha, Radha-Govinda Yugala, Radha/Syama Kunda, Govardhana, Vrndavana, Yamunaji and more. Reciting their perfect prayers greatly pleases the Divine Couple. And it simultaneously purifies, enlightens, enriches, satisfies and delights the heart of the reciter. As a great way to please Srimati Radharani during Karttika, you can daily recite the following astonishing prayer written by Radha-kunda nivasi, Sri Raghunatha Dasa Goswami. ***This prayer is in “mallini meter”. The / mark in each line indicates the break between chanting the first half of the line and the second. O Govardhana Hill! Held by the staff-like arm of your personal Master, You became an umbrella to destroy the pride of Devendra, the intoxicated, bold and arrogant one. Thus, O Govardhana, You are the incomparable King of mountains. And You are so dear to me, so please give me residence near You! O Govardhana! Please grant me residence near You, so I can get a chance to see the youthful Divine Couple, Radha-Govinda, as They enthusiastically enjoy maddening amorous pastimes in Your many caves. O Govardhana! In great delight, Krishna, Balarama and the cowherd boys play many games in Your plentiful valleys, caves, waterfalls, the hollows of Your trees, on the peaks of Your hills, and Your incomparable bejeweled thrones. O Govardhana! You are so dear to me, so please give me residence near You! O Govardhana! By manifesting as the splendorous and fragrant blue stone platforms at Dana Ghati, You witness the tax lila of Radha-Krishna—the youthful Divine Couple and the ocean of rasa. Thus You increase the ecstasy of all rasika Vaisnavas! O Govardhana! Please give me residence near You! O Govardhana! You affectionately and secretly embrace the neck of Your dearest friend, the unprecedented Radhika kunda, the beloved of Hari. O Govardhana! Please give me residence near You, so I can see the confidential pastimes of the youthful Divine Couple! O Govardhana! The full meaning of Your name, “sustainer of the cows” is established by Your many shady trees and pasture lands full of succulent grass. Alas! At every moment and with their every step the cows are being fully nourished by You. Thus You are famous throughout the three worlds. O Govardhana! Please give me residence near You! O Govardhana! Agha/Bakaripu honored You immensely by engaging You as a new home for the Gosthavasis to protect them from the sustained anger of Surapati Indra. Please give me residence near You! O Girinrpa! Because the nectar of your name as “Haridasa varya” arose from the moonlike mouth of Sri Radhika, and was recorded in the Srimad Bhagavatam (10.21.18), You are famous in the Vedas as the nava tilaka of Vraja. O Govardhana! Please give me residence near You! O Govardhana! You are a dear friend of Radha-Krishna and Their families. And You give special happiness to all the Vrajavasis, and the hosts of animals and birds attached to You. Out of Your immeasurable mercy and sweetness, O Govardhana, please accept this tired and unhappy one and give him residence near you. O Govardhana! Although I am certainly vile and deceitful, Your dearmost, endlessly merciful Sri Sacinandana has offered You to me. Without considering whether I am qualified or not, O Govardhana, please give me residence near You! Sri Girirja dharana teri sarana ki jai! Giriraja Baba ki jai ho! Sri Raghunatha Dasa Goswami ki jai! Jai Jai Sri Radhe! Enthusiasm—Go on! Stick to it!